DIY projects are always simple right up to the point when you actually start them. This was the case with our NextBolt Biometric lock installation. Apparently, there are two standard hole sizes (1-1/2″ , 2-1/8″) for deadbolts. The project would have been a quick “remove/replace” job were it not for the fact that our door had the smaller opening and the NextBolt required the larger one. Obviously, this was not a showstopper, but it did mean a trip to Home Depot and the addition of a new tool to our collection. There are many ways to turn a 1-1/2″ hole into a 2-1/8″ one. In this case, the difficult part is to make the hole perpendicular to the door so things will align properly. Also, making a hole is easy if you are just drilling a new one, but it is more difficult to enlarge a pre-existing hole as there is nothing to center the drill bit and nothing for it to bite into to get started. In order to drill the hole properly, a jig is needed to align and hold the hole-cutter. The most robust-looking rig at Home Depot is this one from DeWALT. We felt it was better to get the heavier-duty tool. Paying a little more to make a proper hole is cheaper than to have to paying a lot more for a new door if we messed up. 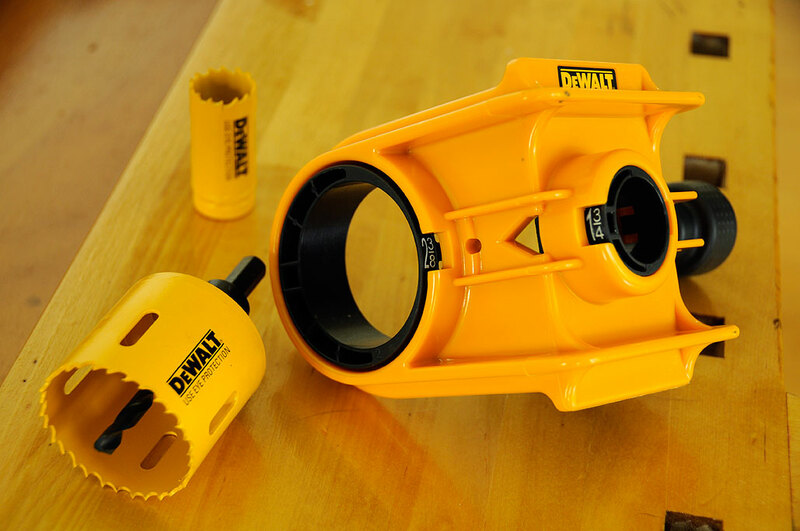 The DeWALT Door Lock Installation Kit comes with two bi-metal hole saws, a drill guide, mandrel with pilot drill bit, and a mandrel adapter. The circular blades can cut holes in metal or wooden doors. The pilot bit is useful for starting a new hole. It screws into the saw, drills into the door, and keeps the saw from shifting around. Normally, this is all that is needed to cut the hole. However, if the opening already exists, the pilot bit will have nothing to bite into to guide the saw. The drill guide is necessary in order to properly make the cut. The guide requires setup prior to use. It is critical to set the guide for both the door thickness (1-3/8″ or 1-3/4″) and backset (depends on the lock: 2-3/8″ or 2-3/4″). The distance is measured from the door edge to the center of the lockset. The NextBolt lock supplied bolts to accommodate both backset distances. So for our installation we could pick either one. The NextBolt installation SHOULD be a simple “remove/replace” job once we get the new hole made. 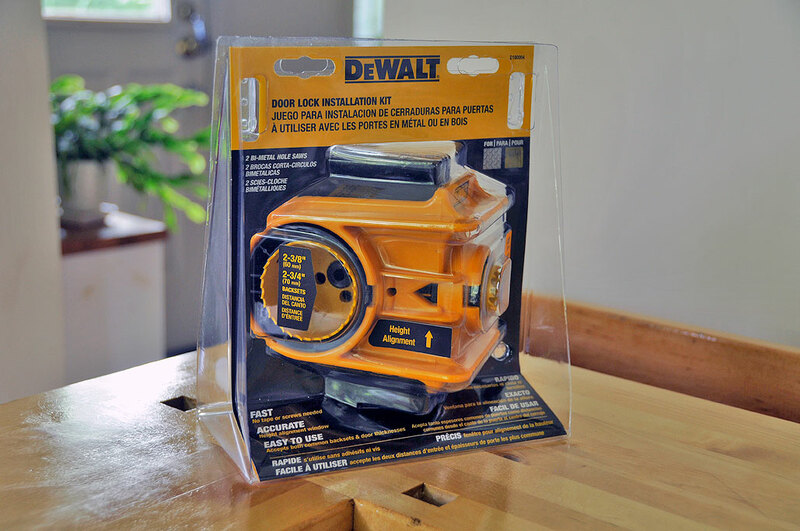 Now that we have this jig, the project should be a breeze 🙂 Full write-up of the FirstUse of the DeWALT Lock Installation Kit will be posted shortly.